For some reason, I really want one of my children to become an architect. It seems like such a cool job that combines both the “right brain,” through the artistic aspects of the job, and the “left brain,” through the mathematical and scientific aspects, to create something both functional and beautiful. And seeing as I have no artistic or STEM skills myself, I’ll have to live vicariously through my children! That’s what good parents do, right? Of course I’m kidding, except about how cool architecture is. And while no toy could actually teach my young children the complicated skills needed to become architects in 20 years, there are several types of building toys that can teach them to think with both sides of their brain at once. And that is a very valuable skill, indeed–whether they become architects or not. Easy for little hands to grasp and manipulate. Let’s do all we can to prevent tantrums from a frustrated toddler, am-I-right? They need no encouragement. Durable and won’t break easily. Toddlers aren’t exactly gentle with their toys. Which reminds me–you might also want to look for something that doesn’t hurt as much when it’s thrown at your head. Trust me; I speak from (too much) experience. Something your child can continue to enjoy as she gets older. The best toys are the kind that grow with your child. They make the cost worth it, and it’s harder to resent them for taking up precious space in your home if they’re constantly being used! 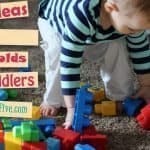 Why Buy Building Blocks for Your Toddler or Preschooler? In addition to being just a fun toy to play with, build and play toys can actually help teach your toddler a number of very valuable skills. It stimulates the “right brain” by requiring your child to use her imagination and creative skills to build something from nothing. Then, after the construction is complete, it can be used for imaginative play with small dolls or action figures. Creative building toys also stimulate the “left brain” as your child uses logic through trial and error. If a tall tower she built keeps falling, your child will try new ways to build it until she figures out what works and what doesn’t. She will also gain a greater sense of spatial awareness, which studies have found to help children do better in math and science as they grow older. For toddlers, building connects toys with learning. 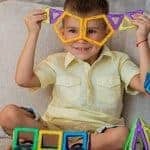 We can’t forget the important motor skills children gain from learning to stack, connect, and break down building toys as well. Then there are the more social and emotional benefits, such as confidence from bringing their ideas to life, learning to work both alone and with others to complete a task, and finally patience and perseverance. Because let’s face it; their constructions will fall down and frustrate them sometimes! Intended for children 6 months to 5 years old, these blocks even work for pre-toddlers and will continue to entertain them as they grow. They can even be used as bath toys! Just be sure to squeeze all of the water out of them and allow them to dry completely, or else you could create a mold buildup. The set includes 26 blocks, each of which is decorated with a letter of the alphabet and a corresponding animal beginning with that letter. There are a variety of shapes to build from, including cubes, cylinders, wedges, arches, quarter cylinders, and more. Soft and safe for babies to chew on, these blocks also won’t hurt when they’re thrown at your head! In fact, they’re actually squishy and will spring back into shape after being compressed. Plus they squeak when squeezed, which can be an added bonus for toddlers (but perhaps a deterrent for parents). This set comes with a storage bag, which includes instructions for how to fit all of the pieces back in. 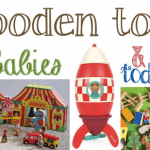 These are some of the best building toys for toddlers, as the pieces are large and easy for small hands to grasp. Even the youngest toddlers, who can’t yet build fabulous creations, still enjoy dumping these bright, colorful blocks out on the floor and trying to put them together. 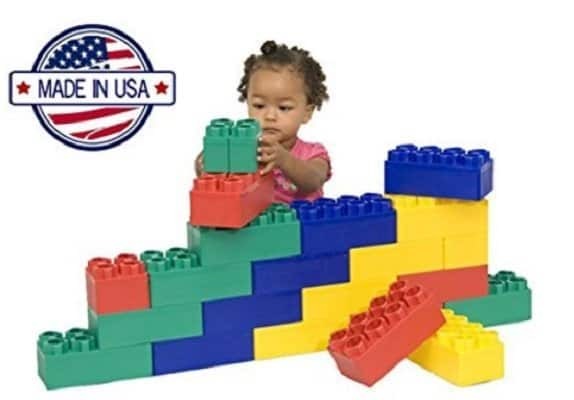 Intended for children ages 1 to 5, these building blocks are fun for young toddlers and preschoolers alike. 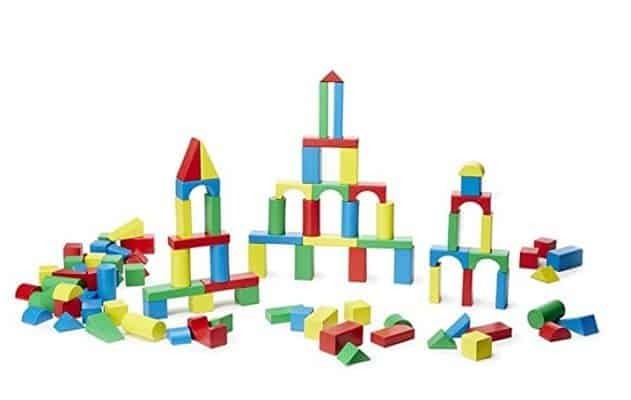 My 4-year-old daughter has finally reached the stage of building elaborate “cities” with these and incorporating them into her pretend play, while her 2-year-old brother simply enjoys building tall towers and then destroying them. The set comes with 80 blocks in various shapes, including long and short rectangles, short and tall squares, and different kinds of base pieces to support tall structures. The pieces fit together easily and securely, so kids won’t be frustrated by their creations completely falling apart if they get bumped. The blocks come in a portable zipper bag with a handle, which allows for easy cleanup and storage, not to mention travel possibilities. 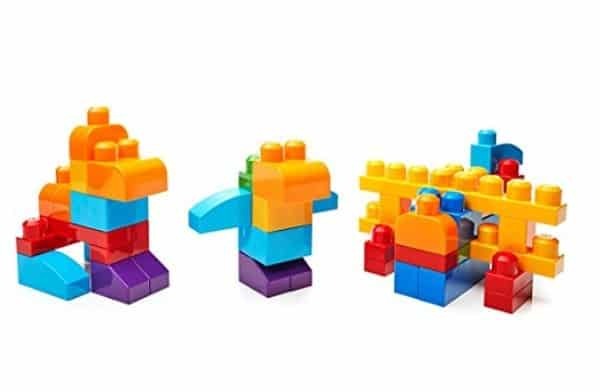 The best thing about these building block sets is that they come in a huge variety of themes and include some of your child’s favorite characters. They have kits to build farms, trains, houses, animals, and more. They also have sets related to Spiderman, the Hulk, and other Marvel characters, as well as the Cars franchise, Disney princesses, Mickey Mouse, and many other favorites from Disney. The sets come with people and animal figures to help children with imaginative play. Each of the pieces in a set also has a clear, defined use that makes it easier for young children to build a recognizable scene. For some, this may seem limiting. But for an imaginative child with multiple sets, the possibilities are endless. After all, you don’t have to follow the designated patterns! 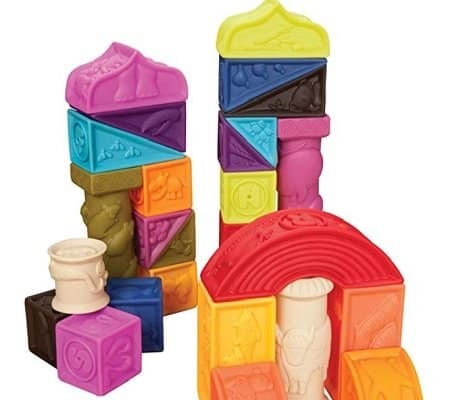 The suggested age range for these building blocks is 18 months to 5 years, so even big kids will enjoy playing with them. There are countless sets to choose from, ranging from basic enough for a toddler to complicated enough for a preschooler. But every set is made up of larger pieces, which are easier for toddlers to handle than regular Legos. And they don’t hurt as much when you step on them! That’s a big parenting win. 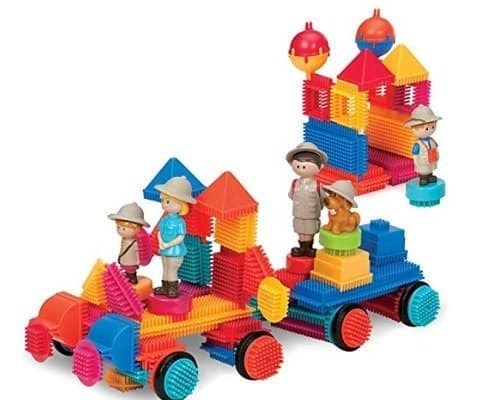 These building toys come in several sets of varying sizes, but the 85-piece set is a great choice because it comes with tons of differently shaped blocks as well as eight wheels, four people figures, and a dog. Perfect for imaginative pretend play! The set also includes a nice carrying case for storage, with a handle for easy traveling. The Bristle Blocks are particularly unique in both look and feel. They are made of a soft, rubbery material with spikey (but soft) bristles on the top that interlock no matter which way you align them. All you have to do is squeeze them together! This makes it so easy for toddlers who are still learning motor skills to connect them without help. The blocks make a very secure connection and won’t come apart easily, which means fewer frustration tantrums. This set of blocks is compatible with the Spinaroo Bristle Block set, which includes silly faces and spinning bases for even more building fun. You will notice there is only one “Con” listed with this toy. That’s because it is a building toy that doesn’t disappoint! 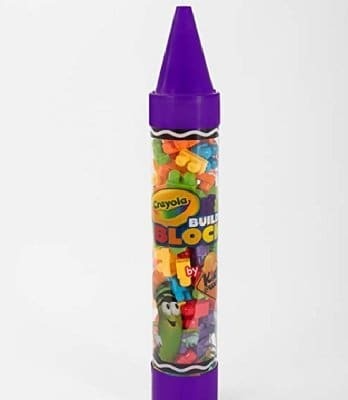 These plastic Crayola blocks are comparable to Mega Blocks. 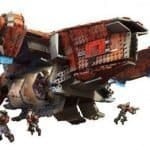 They can also be used with Mega Blocks. The Crayola Kids blocks come in six colors. With 80 pieces, your toddler will have plenty of blocks to make just about anything. This is a great toy construction set. The only thing not to love about the Crayola Kids building blocks toys is that the cute Crayola crayon container isn’t more durable. It is made of bendable, soft plastic that tears and cracks easily. You will have to find a different container for long-term storage. A plastic storage bin with a lid is a good choice to keep blocks organized. The Kids Adventure Jumbo Blocks are like giant Legos. 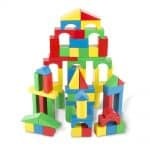 Your toddler will have fun making large creations and towers with these huge children’s building blocks. These lightweight bricks are easy for toddlers to pick up, move around, and stack. Sometimes the bricks are hard to take apart, so your child might need help separating them. You will find the material is good quality, hard plastic. However, that means if your child likes to throw things, you will want to be careful with potential brick throwing. This option is quite different from the others on this list in that the blocks are life-size. The set comes with 40 blocks in three different sizes. The largest blocks, which measure 12″ x 6″ x 3″, can actually hold up to 150 pounds of weight! However, they’re essentially like fake bricks, so there isn’t a variety of shapes to build with. Still, your child will have a blast building a tower that is taller than she is! Plus there’s the great fun of knocking the constructions over with your whole body when you’re done. In fact, the entire act of playing with these blocks is, in a way, exercise. It will get your child up off the floor to bend, stretch, twist, and more as she builds life-size constructions that are perfect for pretend play scenes. It’s a great way to keep your child active during the cold winter months (or during the too-hot-to-go-outside summer months)! This is a classic painted wooden building block set. 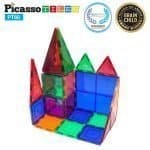 It is great for building towers, castles, or whatever else your child likes to create. 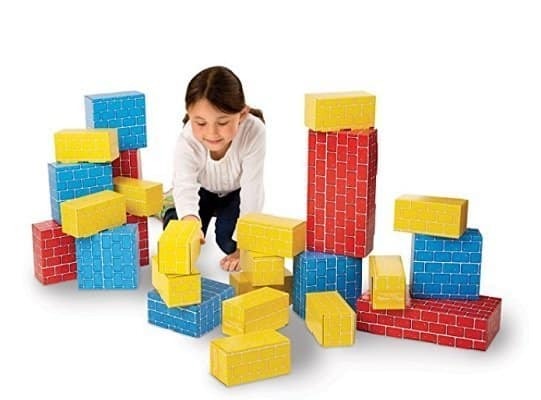 With 100 blocks in 4 colors and 9 shapes, this set will keep your child entertained. It provides great exercise in hand-eye coordination and fine motor skills. The Melissa & Doug Wooden Building Blocks set does not come with a storage container. I prefer using a plastic storage bin for toys like this to keep them organized and easy to store. Be aware that the pieces in this set are relatively small. They could even be a choking hazard if your child puts the pieces in his mouth. This is the iconic wood alphabet block set that has been enjoyed by kids for generations. The blocks are 1 3/4″ square and stack well. Each side of the block contains a letter, either raised, embossed, and painted or stamped onto the block. 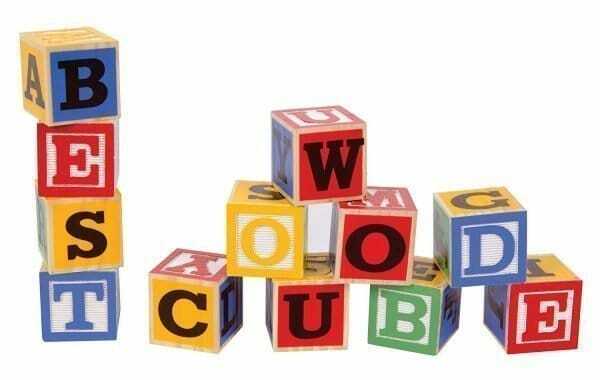 With 48 blocks in the set, your toddler can begin learning the alphabet as well as learning to recognize his or her name. The simplicity of this toy is fantastic. It is a great toy for toddlers as well as older children. This toy takes me back to my childhood. The wood Tinkertoys of the past are gone, though. These Tinkertoys are plastic, which in my opinion is much better. You won’t get wood splinters from playing with these. Also, the plastic is completely safe. 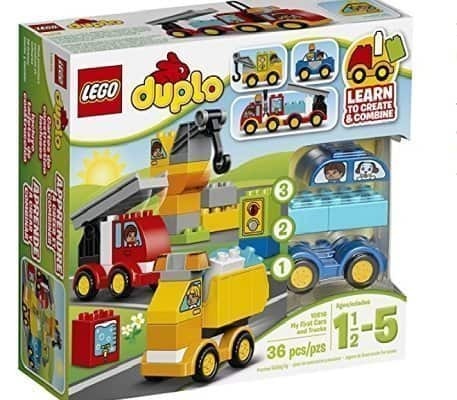 As far as construction toys for boys or girls go, this is a great one. I like that this set comes with 200 pieces, which is a good amount for toddlers (especially if they are sharing). The set comes with instructions of how to make 30 different creations, but of course creative play is always fun, too. 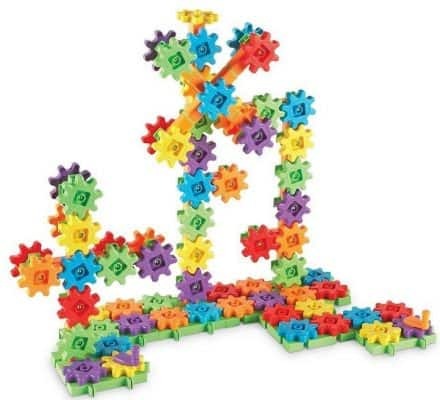 Your toddler will have no problem putting these Tinkertoy pieces together. However, sometimes the pieces are hard to take apart once they are put together. That can be a bit frustrating for little hands. 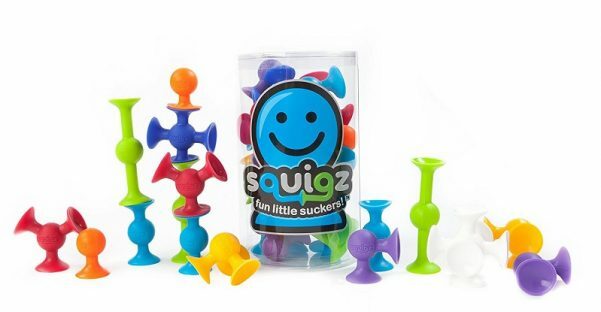 This starter set of Squigz is fun for kids of any age, but be aware it can be a choking hazard! Kids have so much fun sticking these plastic suctioning pieces together to form an endless variety of creations. Squigz are fun to stick on a table top, window, or any other flat surface. We even enjoy putting them on a mirror to see the creation reflected. They are even usable in the bathtub! This 24 piece set is fun to begin with, but your kids will likely eventually want more pieces to play with. Squigz are great at helping improve fine motor skills as well as planning. They also make an entertaining travel toy. Possible choking hazard. Use with supervision for kids under 2. These pinwheel shaped blocks are fun for kids of all ages. With ten different colors, your child can build a huge variety of creations, from animals to buildings to people. 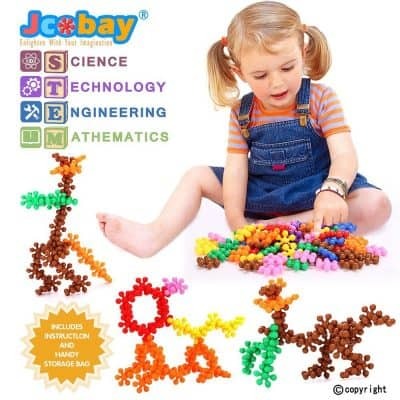 The Jcobay Interlocking Building Blocks come with a fabric bag to store the pieces. These blocks are high quality and very durable. 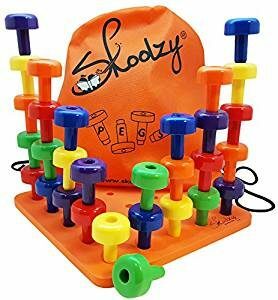 The Skoolzy Peg Board Set is a bit different from the other building sets on this list. This toy focuses on building vertically, but the square board makes it possible to create steps or other 3D creations. Toddlers will learn good fine motor skills as they place each peg into the board or on top of another peg. This set comes with 30 pegs in 6 different colors. In addition to building, toddlers can practice sorting, counting, and color recognition. A drawstring bag makes it easy to store all the pieces. What child isn’t fascinated by moving gears? This toy is fantastic for kids as well as adults. Children will build creations with gears they crank to make the parts move. This set comes with 150 pieces, including gears, cranks, axles, bases, and connector pieces. The plastic tub is sturdy and great for storing all the pieces. Also included is an activity guide to show you some of the possible creations you can make with the Learning Resources Gears! Gears! Gears! Super Building Set. 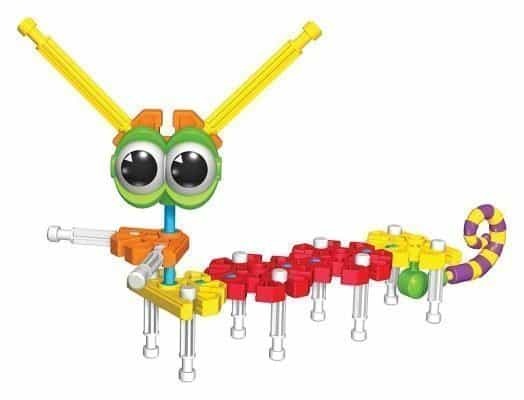 Did you know that K’NEX has building sets for toddlers and preschoolers? The KID K’NEX – Build A Bunch Set comes with 66 pieces which are bigger and fatter than regular K’NEX pieces. This makes building easier for younger children (and keeps them from getting frustrated). It’s nice that this set comes with instructions on how to make 30 different creations. However, since there are only 66 pieces in the set, you can only make one of these creations at a time without running out of pieces. K’NEX has excellent customer service. They will even replace any lost pieces! These are fun magnetic blocks for toddlers. All kids seem to love magnets. Something about the magnetic attraction is fascinating and exciting. The Picasso Tiles allow you to put the magnetic shapes together in different ways to build an endless number of creations. 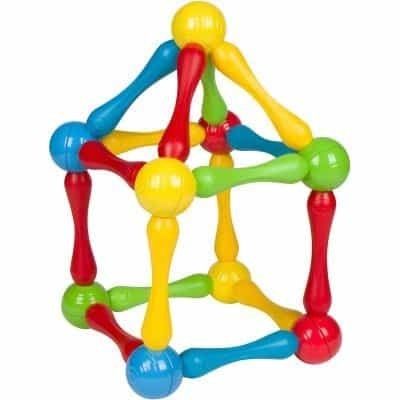 The five different shapes and five different colors make this toy even more fun. The varying shapes mean there are a lot more options in building than with building toys that have only one or two different shapes. You can be confident that Picasso Tiles are made from safe materials. The only drawback I see with this toy is that the magnets could be stronger. If you make too tall of a creation, it will fall over. 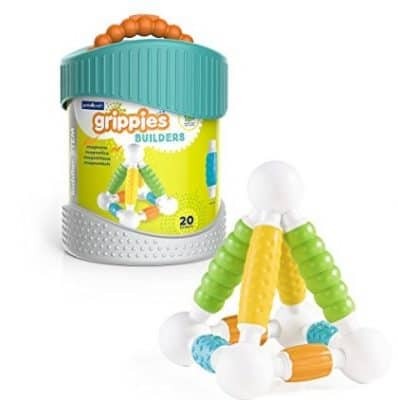 The Guidecraft Grippies Builders was a 2017 Toy of the Year Finalist. Unlike many construction toys, this magnetic toy is made of soft plastic. The pieces are very large, which is great for small hands getting used to manipulating objects. This set comes with 8 long rods (5″ long), 4 short rods (3″long), and 8 balls. While this is a good amount of pieces to see if your toddler likes the toy, you will likely need more pieces eventually. 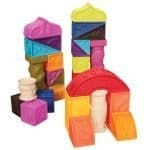 The MIBOTE Magnetic Building Blocks would be a great gift anyone toddler to adult. These magnetic blocks seem to be soothing for the hands and mind. They provide hours of fine motor skills and critical thinking (disguised as fun). You can be confident that the magnets in these blocks are strong enough to hold together but not strong enough to pinch or hurt small fingers. The 109 pieces allow for making several large structures at once. A variety of colors and shapes allow for endless possibilities in building. 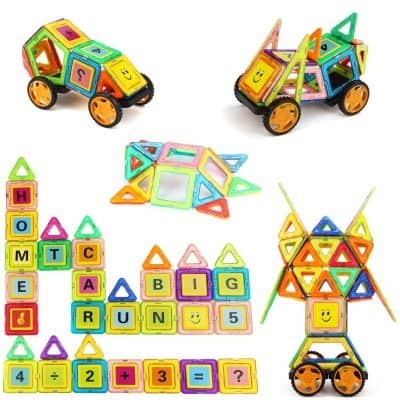 These blocks are considerably less expensive than other similar magnetic blocks, but the MIBOTE Magnetic Building Blocks can be used with other sets. This is another unique building set. There are 60 extra large pieces including balls (2 1/2″ diameter), long rods (5″ long), short rods (3″ long), bent rods (5″ long). Pieces can be used to make either 2-D or 3-D creations. 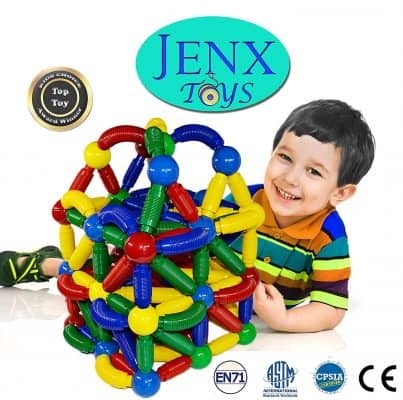 The Jenx Toys Jumbo Magnetic Rods and Balls Building Blocks are made of safe, lightweight plastic. They are durable and fun to use. Extra large pieces are perfect for little hands and fingers, and you won’t have to worry about kids choking on the pieces. This toy is great for parents to play with their kids or for kids to play on their own. The Goobi Juniors 40 Piece Construction set is the winner of Creative Play of the Year Award. It is great for very young kids and for older kids as well. Jumbo size pieces make it easy for little hands to manipulate, and you won’t have to worry about your child choking on the pieces. Rods measure 6.7″ and the hollow iron balls measure 2.4″ in diameter, which means finished creations will be quite large. Vibrant colors and safe materials make this toy even more desirable. Goobi Juniors also comes in a 20 piece set, but we find that the 40 piece set allows more options in building.